In the 1980’s Roger Douglas in his foolish belief in the righteousness and efficiency of the market place laid waste to the public service. He sold of all sorts of public assets and functions of the State often at fire sale prices and sometimes with the most dubious of procedural integrity. What he also sold was the power for government to act as agent for the nation. In the good (relatively!) old days before Roger a Minister got things done by allocating a budget and directing the relevant Head of Department or Ministry to get on with the job. Now this wasn’t perfect but that is a foible of democracy. Roger didn’t change the quality of the governance he only changed the manner in which they can take action. Unfortunately for the worse. Much of the advice Roger listened to came from lawyers and accountants and partners in the big consultancies. These people are not known for their altruism. What these people want is more business for themselves. They of course told Roger that they could do it better than some boring old public servant on a tenth of a consultants pay. Roger being a dogmatist and not a thinker took to this as THE ANSWER. So we got a country run by economists and bankers and accountants and lawyers in place of public servants. Now if you want to get an accountant or a lawyer to do your bidding you have to write laws and regulations and pay big bills. You can no longer just get on the phone and give orders to your lowly paid and subservient bureaucrat. So Parliament started writing laws to get done what once was done with a few phone calls and the honest hard work of a dedicated public service (not always but mostly) with the results being obvious in the graph below. And so everything became expensive and complicated and hard to do. 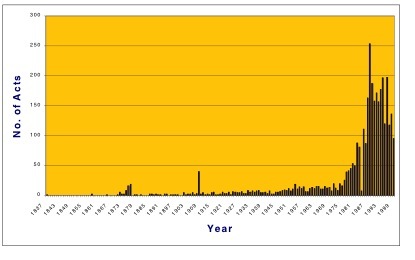 As the graph shows law making went exponential with Roger’s reforms. Where before the reforms parliament was busy if it passed 15 new pieces of legislation a year quite quickly it was passing 150. And while parliament was busy passing all this legislation it stopped doing anything else. It lost any vestige of strategic view it had and instead become bogged down in a vast complexity of select committees and parliamentary debates. The accountants and lawyers and consultants loved it. Every new law bought more work for these parasitic elements of the economy. And so we became a country bogged down in a vast complexity of vested interests playing with legislation. But for all of this legislation and for all of the expensive minds working in the system we now get less done than we ever did before the reforms and nothing got cheaper or more efficient. Even dear old Bill English lamented recently that the non-productive part of the private sector share of the economy (lawyers, accountants, bankers and consultants) was growing far faster than any other sector of the economy. This legislative binge has also bred a whole new public service that is about writing and interpreting rules and managing information rather than doing anything useful. In hindsight Rob Muldoon might not have been so bad. At least he got things done. But more about that in another post.